3 Dots malayalam movie review and FDFS reports from theatres in Kerala are given here. 3 Dots malayalam movie first day first show report is updated here. 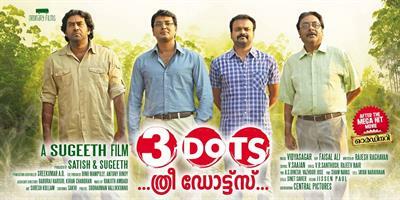 Directed by Sugeeth, 3 Dots was released on 22nd March 2013 in major centres. Produced by B Satish and Sugeeth under the banner of Ordinary Films, the movie features Kunchacko Boban, Biju Menon, Prathap K. Pothan, Narain, Janani Iyer and Anjana Menon in lead roles. 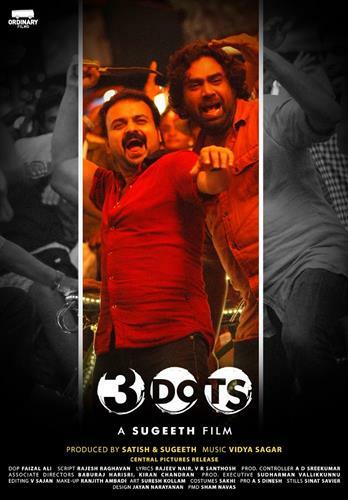 3 Dots, the 45th malayalam movie to get released in 2013 has a couple of reasons to be get noticed much before its release. After the bravura run made by 'Ordinary', the team is back with another extra ordinary movie to woo the fun loving audience. Sugeeth who worked as associate with Kamal for Gramaphone till Aagathan had changed the fortune of many actors with his directorial debut 'Ordinary'. Made with a budget of 3.5 Crores, the movie collected 15 Crores at box office was the 2nd Blockbuster out of 4 in 2012. The movie gave a real break to the Kunchacko Boban, Biju Menon and other lead actors to keep their foot strong in the movie industry. Kunchako Boban and Biju Menon who had proved their onscreen chemistry with 'Ordinary' and 'Romans', are ready to enthrall the viewers with '3 Dots'. Prathap K Pothen who had made a real comeback with '22 Female Kottayam' would join them to keep the theme of the movie active. As the name suggests, '3 Dots' walks through the life of 3 people scratching into their mysterious past, present and future. 3 Dots revolves around the life of three criminals who meet at the jail and later become friends. Vishnu (Kunchacko Boban), Louis ( Biju Menon) and Padmakumar( Prathap Pothen) who had to spend a part of their life in jail for various reasons, found comfort in their relationship which add more glitters to life. After getting released from the jail, the three decide to away from their past while prefer to do live like normal human beings. Vishnu starts an ambulance service; Louis gets attached to a driving school run by Grace (Anjana Menon) while Padmakumar starts a day care to earn for their living. The three dots represent three characters in the movie while incorporating them together in a symbolic way. Padmakumar or Pappettan (Pratap) represents the past; Louis (Biju) represents the present while Vishnu (Kunchacko) is the future. When standing separately each dot represents a full stop, but when joins together it indicates continuation. Narain who plays the role of psychologist Dr. Isaac adds oxygen to the life of three after released from the jail. Avan Ivan fame Janani Iyer is the lead heroine enacting the role of Lakshmi, a teacher who keeps Padmakuamar's day care centre active. Sugeeth had given full dedication behind camera to keep the script alive which was written by Rajesh Ragahvan. Filled with humour and thrilling expeditions, 3 Dots will have twists and turned coupled with an interesting climax. 3 Dots can be called as Sugeeth’s sole movie crafted for those movie lovers who wish to get entertained. The on screen chemistry of Kunchacko Boban, Biju Menon and Pratap Pothan was much interesting while Naren as Dr. Issac too kept the story rolling till the end. Even lady actors Janani Iyer and Anjana Menon kept their presence high, even though the movie was concentrated on the life of the three with instances to tickle the bones of the audience. But the script of the movie had slipped in some instances with some characters failing to show their presence well. Master Vivaswan, Raghavan, Krishnakumar, Niyas Bakker and Sreedhanya gave life to other various characters. Sugeeth as a director had done his job well behind the camera. But he failed to keep the pace as shown with his directorial debut ‘Ordinary’. The tunes of Vidyasagar were magnificently captured by Faisal Ali which was seen throughout the movie. The cuts by V Saajan and the artistic perfection shown by Suresh Kollam have to be specially mentioned. In short ‘3 Dots’ is a watchable flick for this vacation which can keep your mind refreshing. So get ready to join your family to enjoy a visual treat.